RPA have always worked very closely with the Health & Safety Executive and BSIF in the UK and are very proud to have recently been appointed Examiners and Assessors for the Fit2Fit scheme. With a wealth of experience in practical Fit Testing combined with expert Portacount technical know-how, we are very proud of our unrivalled levels of expertise in the UK. This unique combination of skills and knowledge allows us to provide training courses which are second to none in terms of depth, skills and practical advice. RPA are in a unique position to offer a new coaching course for those planning to seek Fit2Fit Accreditation. Fit2Fit Coaching is a Full Day course aimed at experienced Portacount or Qualitative Fit Test Operators who wish to revise their skills and knowledge prior to attempting a formal Fit2Fit Assessment. A formal Portacount or Qualitative Training certification is a pre-requisite for this course and we expect that candidates should have several months experience of Fit Testing prior to attempting to achieve Fit2Fit accreditation. Fit2Fit Coaching can be provided at one of our regular scheduled courses in Bristol or on-site throughout the UK. Please see our forthcoming dates for our next scheduled training courses. RPA are TSI Channel Partners and Portacount Training Partners for the UK. With over 10 years experience of Face Fit Testing we provide TSI-authorised training, technical backup and fit test consultancy services for Portacount users throughout the UK. 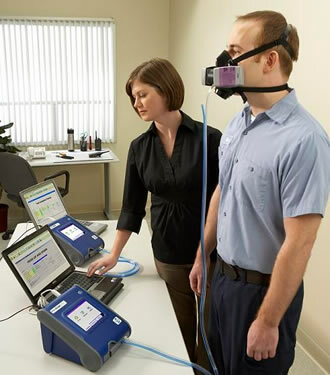 All our trainers are experts in RPE Fit Testing and have a wealth of experience of practical fit testing with every type of mask.